Conifers are Gymnosperms. They are cone-bearing seed plants with vascular tissue. 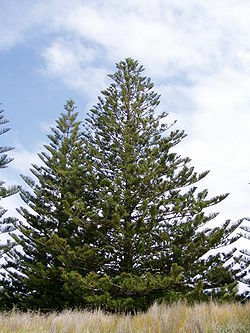 All living conifers are woody plants, and most are trees. The earliest conifers were in the late Carboniferous (Pennsylvanian) period (about 300 million years ago), Pinophytes, Cycads, and Ginkgos all developed at this time. These plants live without being so dependent on water. Other adaptations are pollen (so fertilisation can occur without water) and the seed, which allows the embryo to be transported and developed elsewhere. Conifers appear to be one of the taxa that benefited from the Permian–Triassic extinction event. They were the dominant land plants of the Mesozoic era. Conifers were eventually overtaken by the flowering plants, which first appeared in the Cretaceous. Flowering plants became dominant in the Cainozoic era. Conifers were the main food of herbivorous dinosaurs, and their resins and poisons no doubt gave them some protection against herbivores. All the reproductive features of modern conifers had evolved by the end of the Mesozoic era. ↑ 3.0 3.1 3.2 Henry R.J. 2005. Plant diversity and evolution. London: CABI. This page was last changed on 17 December 2018, at 10:34.